Pig cancer has been widely studied because pigs cancer advantages include the resemblance in anatomy, physiology, and genetic makeup with the human, as well as new methods to manipulate the pig genome. So there is alot of research that continues to be done with regards to pigs and cancer. Some of the articles are older and additonal research has been done, but the studies have not been published publicly, so I am including links to studies that can be viewed by anyone. I do have access to some studies that are published on sites only healthcare personnel can access. These are just a few things you should be aware of when adding a pig to your family. This does not mean your pig may get cancer, but it is certainly a possibility. In the past 15 years (2001–2016), the incidence of reported neoplasia in pet pot-bellied pigs has increased, mostly as a consequence of increased life spans resulting from improved veterinary medical care. Pigs are predisposed to some genetic cancers as well as other types of cancer. Reproductive cancer is extremely common in pigs that were never spayed/neutered, but especially in the females. I have seen research studies indicating a percentage as high as 75% of ALL females will develop some kind of neoplasm or tumor in the reproductive organs as they age, which is why we let others know the importance of spaying and neutering your pig. These pigs age data were available for 27 of the 32 pigs and ranged from 4 months to 19 years. The study is linked below from Sage Pub. Once a tumor is detected, it needs to be removed. This is a costly procedure. While the tumor is being removed, a spay is done at the same time, only you arent only paying for a spay, now you are also paying for tumor removal, so the costs are quite a bit higher. Tumors are historically very vascular which means they are full of blood vessels that require cauterization when being removed. This obviously increases your pigs risks for surgery because they are likely a larger size, older and will need to be under anesthesia for a longer period of time in additon to the potential for blood loss during surgery. As with any surgery, age does come into play because it takes longer for a larger/heavier pig to heal than it does to recover from a simple spay at a younger age. Males are no different. Testicluar cancer is common in the boys. Same rules apply, as tumors are removed, because they are so vascular, they will require a skilled surgeon to remove them and this type of procedure will require a lengthy surgery increasing the risks for complications. You can read more about reproductive cancer in mini pigs by clicking here. Skin cancer is another common cancer in pigs. Melanoma is a serious form of skin cancer. It begins in melanocytes, the cells that make the skin pigment called melanin. 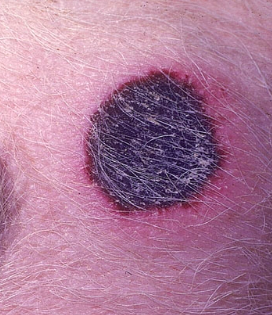 Swine melanoma can be a hereditary type of cancer. Research scientists have studied this in pigs for a number of years so there is plenty of research studies out there for you to be able to reference. Several will be linked to the resources used below. Melanoma begins with the cells that make the skin pigment called melanin. Therefore, coloured animals, such as the black swine (Geffrotin et al 2004) and Duroc (Smith et al. 2002) are more susceptible to melanoma. Müller et al. (2001) noted that no animal with white coat colour was affected in their 176 experimental animals. Müller et al.’s association analysis (2001) strongly indicated that a dominant allele in white phenotypes suppresses the presence of swine melanoma. The explanation is the lack of melanocytes in the skin of dominant white pigs caused by a mutation of the c-KIT gene, which leads to a failure of melanoblast migration and development. Therefore, the dominance allele may be utilized for remedy the issue in commercial level. Malignant melanoma is a type of cancer that spreads. What does this mean? It means that the cancer can invade other areas of the body like the lymphatic system, lungs, bones, etc. Once a cancer is deemed malignant, it is difficult to treat because if the primary cancer is untreated, it will continue to spread until it is so widespread, the only humane option is to make the pig comfortable until natural death occurs or humanely euthanize the pig. This is what we are adding this page for, to avoid these types of situations. ​Another study identified 92 cases of leukemia in 3.7 million pigs tested, and 58% of those cases were in pigs under 6 months of age. Leukemia is a cancer of the blood and can be extremely difficult to treat. Chronic myeloid leukemia (CML) is a clonal proliferative disorder which involves the myeloid, megakaryocyte, and erythroid lineages. An excerpt from one of the reseach studies directly conflicts the info found in other articles "Symptoms such as fatigue, lethargy, loss of appetite, and weight loss are commonly observed. A similar clinical picture was observed in our miniature swine at time of disease presentation. A diagnosis of CML is challenging in pigs due to the absence of clear genetic markers, therefore a thorough and often extensive workup was necessary to confirm the diagnosis. A leukemoid reaction was ruled out as no other infectious/inflammatory agents were identified to be responsible for the leukocytosis. All the animals reported here were important breeders within our MGH MHC-defined miniature swine herd and a diagnostic workup was performed for the treatment of their condition. Once leukemias were identified with an incidence higher than expected, we instituted a protocol for their diagnosis with the goal to harvest them, and develop tumor cell lines for the study of leukemias. We have not observed myeloid leukemias in young pigs which is consistent with reports of chronic leukemias in other domestic species." Hepatocelluar lesions are a common neoplasm found in pigs. One study I was able to find did list the official diagnosis as hepatocellular carcinoma. (Also linked below) A 10-year-old, lethargic, potbellied pig presented with signs of abdominal discomfort and a palpable abdominal mass later identified as splenic hemangiosarcoma. Laparotomy revealed a 20 cm diameter mass on the spleen and smaller masses on the omentum and liver. After euthanasia and histologic examination of the hepatic mass, the diagnosis was hepatocellular carcinoma. Some of these hepatocellular carcinomas have been confirmed as metastisizing to the lungs as well. ​Oral squamous cell carcinoma has been reported in potbellied pigs. Gastric carcinoma, intestinal adenocarcinoma, cholangiocellular carcinoma, endometrial adenocarcinoma, chronic lymphocytic leukemia, and possible splenic hemangiosarcoma. There are rare reports of hepatocellular adenoma and carcinoma in Vietnamese pot-bellied pigs, and metastasis of hepatocellular carcinoma to the lungs has been documented.